Hello, and welcome into our home for a little holiday tour of our dining room. I think the word “eating area” describes this spot a little better than dining room as it’s really not a room, but more of an area we pass through when we round the corner from our living room to our kitchen. I’d like to thank Marty from A Stroll Thru Life for hosting a really lovely Christmas Home Tour this week, and for letting me be a part of it. If you’re stopping by from Inspiration For Moms, welcome! I am so glad you are here! Let’s get started, shall we"
…and not the traditional holiday colors (although I really am loving all the traditional holiday colors I’m seeing this year). 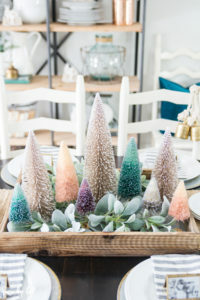 I was really drawn to teal blue and blush pink this year as a fun color combination for the holidays. They’re just so happy and cute, and I really just couldn’t get enough of them! I also pulled out my DIY Photo Place Cards from last Christmas. These fun little place cards personalize the table year-round, but look especially cute on the holiday table.